Examples, solutions, videos, worksheets, stories and songs to help Grade 5 students learn how to multiply decimals. 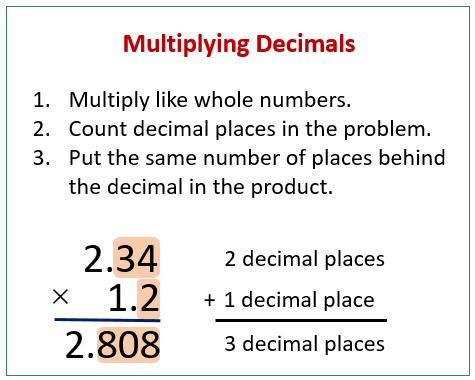 The following figure shows how to the steps when multiplying decimals, Scroll down the page for more examples and solutions. 1. Multiply as normal (ignore the decimal). 2. Count the total number of digits to the right of the decimals. 3. Apply the number of decimal places to the result, starting from the right.